There was no second day miracles for Gavin Moynihan or Neil O’Briain as the pair missed the cut for the second week running in South Africa; this time at the Alfred Dunhill Championship. Having both bowed out early at last week’s South African Open, the pair had hoped for some pre-Christmas cheer at Leopard Creek Country Club but that will now have to be found in the pubs of Dublin along with the rest of us after coming up short once more. For Mount Juliet’s touring pro Moynihan at least, today proved a much better day with the former Island man’s practice disrupted by illness over the past fortnight. The Dubliner fought hard for four birdies but two bogeys ultimately cost him a place in the weekend field; Moynihan’s two-under 70 seeing him fall two shots shy of the cut mark of plus-two. Meanwhile O’Briain had hoped that a new putter in the bag might inspire a comeback but again it was a case of too many mistakes scuppering any momentum. The Old Conna professional eventually signed for a three-over-par 75, one stroke better than yesterday, to finish well down the field on seven-over-par. At the other end of proceedings, David Lipsky will take a one-shot lead into the weekend after firing an excellent bogey-free 66 on day two at Leopard Creek Country Golf Club. The American entered the day four shots out of top spot but produced four birdies and an eagle to surge to eight under to lead the way from a quartet of Scotsmen. Scott Jamieson and Marc Warren were a shot off the lead, one clear of countrymen David Drysdale and Doug McGuigan – whose seven birdies on the back nine handed him the lowest nine holes of the season so far to par. Defending champion Brandon Stone was then at five under alongside fellow home favourites Oliver Bekker, Darren Fichardt and Dylan Frittelli, Australian Dimitrios Papadatos and England’s Oliver Wilson. Last season Lipsky finished outside the top 100 on the Race to Dubai Rankings presented by Rolex for the first time since securing his full playing privileges as an Affiliate Member in 2014. His 132 appearances have brought a win and 15 other top tens but this is his first visit to Leopard Creek and he is loving life on the edge of the Kruger National Park. “I’ve never been here,” he said. “I’ve always wanted to come here, I’ve heard great things from almost every player and it’s turned out to be a great week so far and I’ve just enjoyed the scenery. “I played really well. I actually didn’t hit it that great today but my putting and chipping was amazing. I got the job done and tied it up and I’m looking forward to the weekend. Lipsky made a birdie on the 11th and an eagle on the 13th before a gain on the 16th saw him hit the front. Jamieson joined him with a stunning run of birdies, making gains on the 13th, 14th, 15th, 17th and 18th to turn in 32. Lipsky made birdies on the second and third to lead by two and when Jamieson bogeyed the second, the advantage was three shots. The 35 year old picked the shot straight back up on the next and made a gain on the sixth to cut the advantage back to one as Lipsky parred his way home. Warren had to go to the Qualifying School to regain his card in November and started the season with a top 25 in Johannesburg last week. He made a move with birdies on the tenth, 13th and 14th but sandwiched another gain on the 16th with a pair of bogeys to turn in 35. A big finish then fired him up the leaderboard, picking up shots on the fifth and seventh and holing a bunker shot on the eighth. McGuigan had bogeyed the first and fifth but a birdie on the eighth was the first of eight in 11 holes, as he made four in a row from the tenth and further gains on the 15th, 16th and 18th. Overnight leader Bekker lost ground with a 73, while countrymen Fichardt, Frittelli and Stone all signed for rounds of 70. Wilson is playing by virtue of a top ten last week and he continued his good run with a 69, while Papadatos carded a level-par 72. 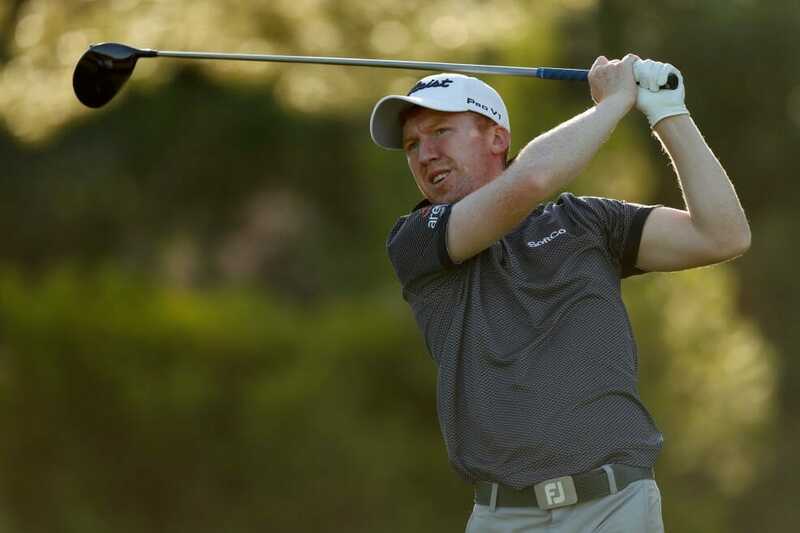 Finn Kim Koivu lowered the course record at the newly-renovated Leopard Creek with a 65 to sit in a group at four under that also contained four-time Major Champion Ernie Els, last week’s victor Louis Oosthuizen and Swede Niklas Lemke – who finished his round with six straight birdies.